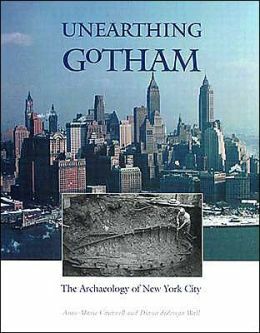 Recently, I was preparing for my History of New York City course by reading Anne-Marie Cantwell and Diana DiZerega Wall’s Unearthing Gotham, a book on New York’s archeology recommended by my colleague Joe Diamond, Chair of Anthropology at New Paltz. The book includes a story about Tantaque, a Munsee Indian, and his meeting with two Labadists in Manhattan on October 16, 1679. The Labadists, Jaspar Danckaerts and Peter Sluyter, were scouting New Amsterdam as a possible location for their small religious sect to relocate in North America. Like the Quakers, the Labadists believed in a radical interpretation of the gospels and split from established churches to form their own community, moving from place to place in search of a welcoming environment. Interesting as the Labadists were, I was more intrigued by the fact that the authors of Unearthing Gotham named an individual Munsee—Tantaque—and were able to fill in some of his biography. 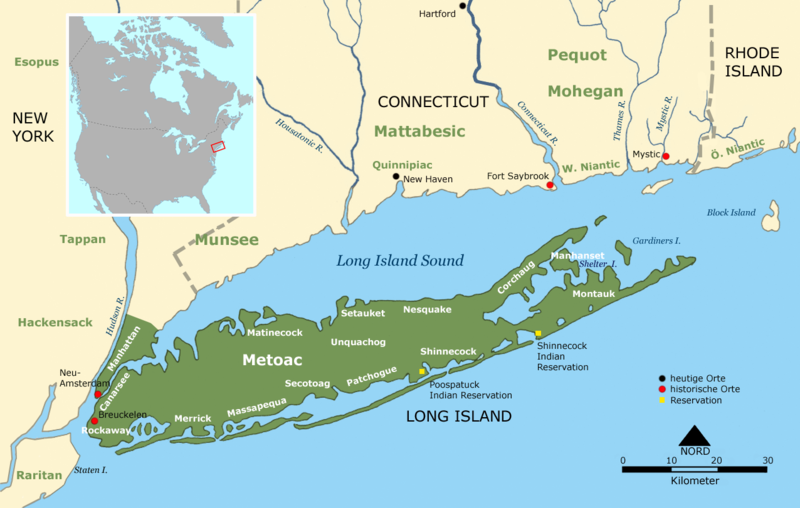 They described him as “an eighty-year-old man originally from Long Island” and “a well-known figure in early New York, for he was a generous man and, in his younger days, had often given fish to starving Europeans.” This anecdote immediately reminded me of Squanto (also called Tisquantum), the famous Pawtuxet Indian who assisted the Pilgrims in their early days and is associated with the first Thanksgiving. Yet I realized that I had never heard a Munsee Indian from this period named or personalized in any way. In most of my readings, the Munsee people were characterized as a group. 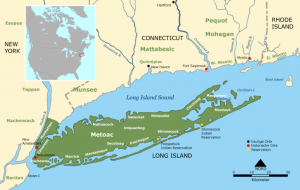 Often defined in contrast to the Iroquois Confederacy, the Munsees (also called Delawares) were Algonquian peoples who lived in the Hudson River Valley, on Long Island, and along the Delaware River. Within the Munsee were smaller communities, such as the Esopus (in what is now Ulster County), the Wappinger (across the river), the Minsink (along the Delaware), the Tappans (along the Palisades), the Raritans (in present-day New Jersey), the Massapequas, Rockaways, Merricks, Matiecocks, and Secatogues (all on Long Island), and others. The Munsees were the Native Americans whom we remember as selling Manhattan to the Dutch in a bad land deal, a group that was greatly reduced by disease, then quickly removed in a series of wars—Kieft’s War (1640-45), the Peach War (1655-56), and the Esopus Wars (1659-63). None of them, in my memory, had individual names or lives that one could trace. This entry was posted in Long Island on November 25, 2013 by Susan Lewis. One of the most interesting objects on display at the Senate House State Historic Site Museum in Kingston, New York, is a miniature painting of a single female eye: The Eye of Theodosia Burr. This delicate image symbolizes the intersecting stories of three New Yorkers: the painter John Vanderlyn (1775-1852), his patron, Aaron Burr, Jr. (1756-1836), and his subject, Burr’s beloved daughter Theodosia (1783-1813). All three stories represent different degrees of unfulfilled promise and unhappy endings. The most familiar name of these three is that of Aaron Burr. Like Benedict Arnold, about whom I wrote in a previous blog, Burr is considered one of the great villains of New York history—most famous for killing his political rival Alexander Hamilton in a duel in 1804. Burr was a clever, cultured, and well-educated man who grew up in New Jersey (his father was the second president of the College of New Jersey, now Princeton University, and his maternal grandfather was the famous minister Jonathan Edwards). Orphaned as a toddler and raised by relatives, Burr was admitted to college at the age of 13, and studied theology and law after his graduation. He joined the Continental Army in the early days of the Revolution, traveling with Benedict Arnold through the Maine wilderness for the attack on Quebec (see blog from October 17th, Benedict Arnold’s Boot, Part 1). This entry was posted in Hudson Valley, New York City on November 15, 2013 by Susan Lewis. How did women get the right to vote in New York State? Most of my students assume that all women in the United States were granted suffrage at the same time, as the result of the 19th Amendment to the U.S. Constitution, passed in 1920. To the contrary, women won the vote across the country in an irregular, piecemeal fashion. The territory of Wyoming allowed women to vote in 1869, and joined the union in 1890 as the first state where women could vote in all elections. By the time the women’s suffrage amendment was passed, 15 states across the country (including New York) already had full suffrage, and more had partial suffrage – that is, women could vote in some but not all elections. For example, in some states or localities women could vote in presidential elections, primaries, municipal elections, or school board elections. Often my students assume that New Yorkers Susan B. Anthony and Elizabeth Cady Stanton were responsible for winning the suffrage campaign. Unfortunately, neither lived to see women gain the vote either nationally or state-wide. Essentially, they failed—not for lack of energy, organization, or compelling arguments, but because they were unable to convince the male voters of their period that women needed or deserved the vote. Even the majority of women in the United States were probably not persuaded that enfranchising women was a good idea at the time that Stanton and Anthony died (1902 and 1906, respectively). Surprisingly to us today, there was actually a strong anti-suffrage movement led by women, including a chapter in New York. This entry was posted in New York City on November 6, 2013 by Susan Lewis.